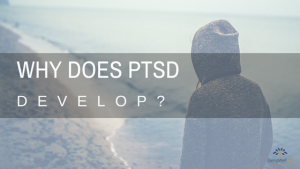 Last week we reviewed what PTSD looks like (you can read about those symptoms here). This week we are going to review why PTSD develops. The focus will be on the role our Fight – Flight – Freeze survival response system plays in the development and maintenance of PTSD. Freeze = shut down physical or emotional pain to just survive when you know you can’t escape or fight back. A clear danger is the easiest way to illustrate how this survival system gets activated: Imagine you are hiking in the woods. If you are in Los Angeles you can imagine hiking in the Angeles National Forest. All of a sudden you hear a low growl and the hair on the back of your neck stands up. 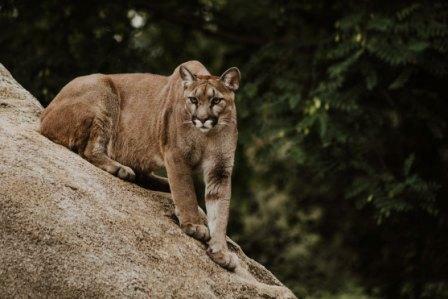 You look to the side and you see a huge mountain lion ready to pounce on you. What do you do in that moment? What happens in your body? Fast, shallow breathing or hyperventilating: This allows your body to take in more oxygen quickly in order to fuel your muscles to fight, run, or endure. Tense muscles: Allows you to throw a harder punch, take a harder punch, or run faster. Dilated pupils: Lets you take in more light, be hyper aware, and able to see all the details of the danger in front of you. Flushed skin, feeling hot and/or sweaty: Allows your body to cool itself down so it can keep running its engine at full speed. Fear, anxiety, panic: Sends your body clear signals that you are in danger and you need to act now. Thinking part of the brain shuts off. You can’t think straight: When you are in danger taking the time to think things through, list all your options and go through all the pros and cons of what to do wastes precious time and can get you hurt. In a trauma situation survival is the only thing that matters and that depends on reacting quickly, not thinking slowly. Tunnel vision: Allows you to block out all distractions and focus on just the danger you need to survive. Digestion shutting down (dry mouth, upset stomach, gastro/bathroom problems, symptoms of irritable bowl syndrome): Digestion takes up a lot of your body’s energy and resources. When your survival system is activated your brain tells your body to stop wasting energy digesting and to redirect all that energy into fight – flight – or freeze. After all, if you are dead you won’t need to digest anything anyways. Weakened immune system: People with PTSD often get sick more often and struggle with chronic illnesses (e.g., diabetes, heart disease). Just like digestion above, when you are in survival mode your immune system gets turned down. Your body is not going to waste energy fighting off a cold because it needs to redirect all that energy to fighting off the danger/threat. Fighting off a cold won’t matter if you don’t survive the danger so your body is not going to waste time or energy on it. EVERYONE experiences the Fight – Flight – Freeze Survival Response when in danger. This is hard wired in our brains (thank you amygdala). This is a normal reaction to an abnormal event. It turns into PTSD only when these symptoms do not go away after a month or when these symptoms go into overdrive and stay on all the time. This list is not all inclusive but reviews several reasons why some people get PTSD while others don’t. Research shows that social support is one of the biggest factors influencing the development and recovery of PTSD. Blaming yourself or being blamed by others for what happened. Victim blaming is very common because it allows the rest of us to go to bed at night without the fear that the trauma would happen to us: “Your Christmas tree burned down because you left the lights on/didn’t use a timer/forgot to water it/should have gotten a fake one/used old lights. That would never happen to me because I wouldn’t do that.” This blames the victim for the fire and lets me sleep better at night, but it also creates a culture of blame that victims often internalize. Blame is an emotion that keeps us stuck and does not allow us to move forward. (I wrote more on the stages of emotion after trauma here). Frequency: how many times have you survived trauma and how many different types of trauma have you been through. Duration: how long have your traumas lasted (e.g., a one time car accident or years in an abusive relationship). Intensity: how intense was the trauma, unexpected, or how much did it turn your world upside down. There are biological changes that happen in the brain. Researchers have demonstrated with fMRI studies that Veterans who have been on multiple deployments, compared to those who have only deployed once, have a much faster acting fight-flight-freeze response in the brain because those neurological pathways have been seared in the brain. You cannot learn how to feel safe again if you never give yourself a chance to try. Avoidance is the #1 reason that keeps PTSD going and getting worse in the long run. 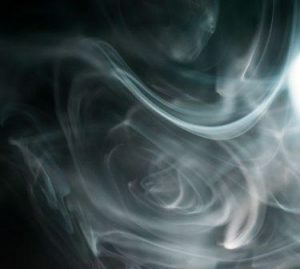 Having PTSD is a lot like having a faulty smoke detector in your brain. Have you ever lived in a place with a small kitchen that had a smoke detector that went off all the time? It went off when the steam from the boiling water reached it, when smoke from your burnt toast reached it, or whenever you tried to sauté anything on your stove. It’s a nuisance and no longer serves its function as the next time you hear it you don’t think “fire!” you think “ugh what now? !” The smoke detector cannot tell the difference between real danger (fire) and false alarms (burnt toast). 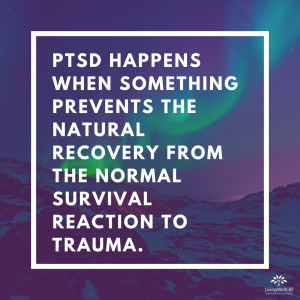 Because of the changes in the brain and the avoidance that happens with PTSD the brain has a hard time telling the difference between real danger and reminders of danger. Imagine how exhausting it would be if that smoke detector was going off in your brain all the time. Would you be able to focus? Would you feel irritable? Would it be hard to sleep? As discussed above, our survival response system is all about reacting quickly to stay alive. Taking time to think can waste precious time so the thinking part of the brain gets turned off. 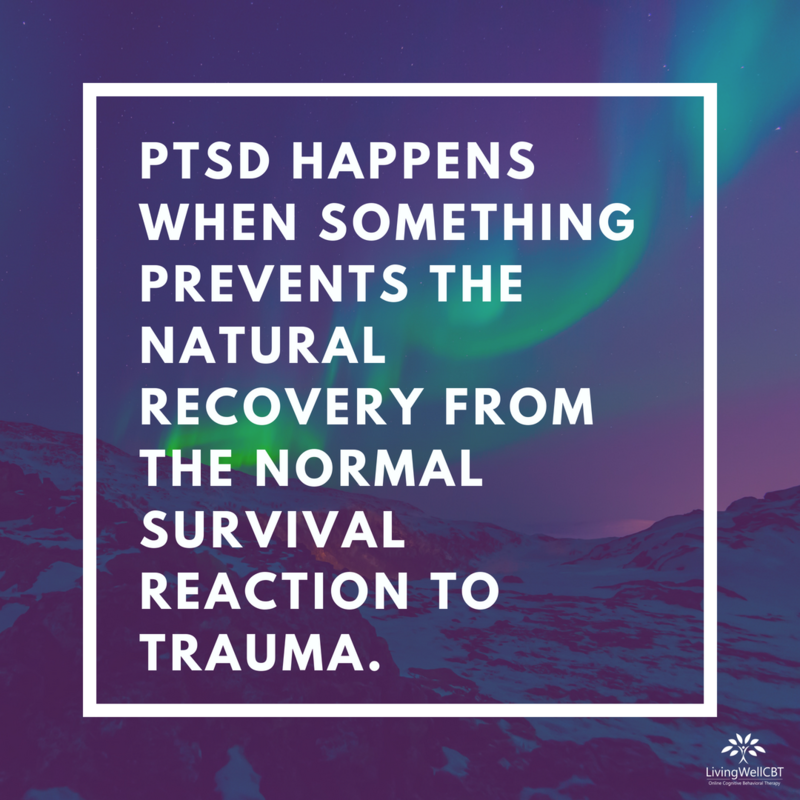 When someone has PTSD they are always in “reaction” survival mode and not “lets think clearly” mode. This makes it hard to concentrate, make decisions, or chose the best way to respond to a situation. PSTD treatment is designed to help you turn OFF that alarm system when you don’t need it and turn ON the thinking system when you do need it. Treatments such as cognitive behavioral therapy, cognitive processing therapy, and prolonged exposure therapy are all designed to help your mind learn to tell the difference between false alarms and real danger and turn on the thinking system again.